Our Chiropractors in work to realign the skeletal system of the physical body through careful manipulation of the spine when one or more vertebra is out of place. Chiropractic treatment in intended to solve spine, other joint problems and pain that results from falls, accidents, stress, tensions, and overexertion while minimizing or completely eliminating the use of medicine, surgery and hospital stays. If you are experiencing pain, stiffness, spasm, decreased range of motion, numbness, headache, tingling or any combination of these symptoms then it is probable that you have a chiropractic issue and you should call our office in for an appointment. My emotions get the best of me when I think about the car accident I was in 4 years ago. It changed my life. I was driving home from a night out with friends, when I was stuck by a drunk driver. she came full speed and rear ended me while I was sitting at a stop sign. I remember looking in the rear view mirror as the car was approaching. The car didn't stop and I hardly had time to react. The impact was terrifying. I passed out. I woke up with the EMS hovering over me. I started to panic, they calmed me down and told me there were no external wounds, and asked me if I had any pain in my body. I told them that my back was in serious pain. They had me move my legs and toes. I could move them, thank God. I was taken to the emergency room and took x-rays of my back, I had a hairline fracture on my tailbone and some of my discs had shifted out of place. The doctor suggested surgery to fix some of the issues it was either that or pain killers while it healed. The thought of surgery had me thinking about my uncle. 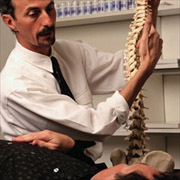 He had back problems and had undergone many back surgeries. He lived from walker to wheelchair for many years. It was a terrible thought. I had a cane to help me walk, I felt like an old person and I was only 34! It went on like this for a couple of months. I couldn't stand it anymore. I thought sugery would be easier than this. I signed up to get my first surgery, and the thought of my uncle kept playing in my head. I don't want to be like that. I was frustrated to the point of tears one night after not being able to move without terrible pain shooting down my leg while I layed there. The thought of having to live like this for the rest of my life was overwhelming. A whole bottle of pain killers started to look like an option, I prayed for anything else. A friend of mine called me that I hadn't talked to in years. I mustered up enough energy to talk. Daniel wanted to grab some dinner, I told him about my accident and that my back I was hurting too much. He was disappointed, but then what he told me was the first glimmer of hope I had heard in a while. He said, You're in luck Ray, My wife is a chiropractor. "She'll get you better in no time." His tone made me think he didn't not understand how bad my contidion was. I tried to tell him that this was beyond any help of a chiropractor, but he wouldn't listen. He set me up an appointment with his wife Shelly the next day. I was intrigued, I never went to chiropractors cause I always relied on medical doctors. Now Medical Doctors had failed me and I figured I"d try a different method. I walked into Shelly's office and Daniel showed up for moral support. Shelly took a few X-Rays and did some tests with me. She had me lay down, and started realigning my back. I felt a crunch in my back and it was like a miracle, a weight on my back had. I felt it all through my body. I literally had goose bumps. When she finished I sat up with a grin on my face. I could tell something was different...Better. I had a huge list of questions for Shelly which she answered with a grace and patience like no other. She Actually took some time to listen to all my concerns unlike Dr. Joe Schmo who wanted to get the best bang for his buck.